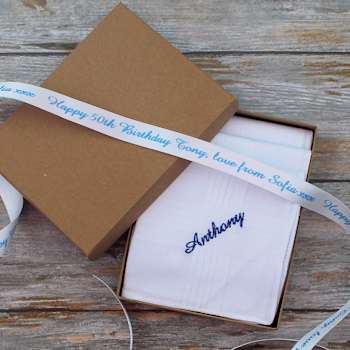 Mens or Ladies set of three personalised embroidered handkerchiefs in gift box with personalised ribbon tied around. Three classic white cotton handkerchiefs you can choose from a mens size or ladies size. Each hanky is personalised with initials or a name. Each hanky is personalised with initials or a name. Just fill in the option box and choose what colour thread and font style you would like for your custom embroidered handkerchiefs. Gift set of 3 handkerchiefs comes in a gift presentation box complete with a personalised printed satin ribbon tied around. We use a ribbon colour to compliment the embroidery thread colour you choose. Please enter the wording you would like on the ribbon. This can indicate who the gift is to and from or perhaps a simple little message such as Happy Birthday!